In stock. Order in the next 6 hours, 5 minutes and it will go out today! Leaf Back Decks are perfect for stocking stuffers, holiday gatherings, or family game nights with cocoa and a blazing fireplace. The Leaf Back design was originally released in 1947, making these cards historic as well as holiday-appropriate. The intricate leaf pattern comes in red or green, with metallic gold accents, while the fronts retain the classic four-color design. 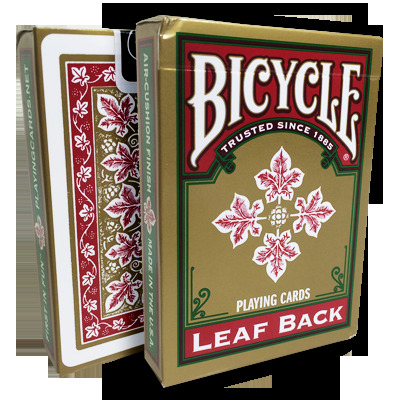 The Leaf Back Decks are printed on quality Bicycle card stock with patented Air-Cushion finish, and features original art on the backs. These decks are made in the USA at the United States Playing Card Company. The faces of these cards are identical to a standard rider-back deck, so it has a very standard look suitable for magic and card games. But what makes this deck attractive is the leaf back design on the card backs. It gives the entire deck a whole new look, and makes it look classy and elegant. The red fits well with the red on the card faces, so it complements the overall colour scheme. Also very good value considering the price.